Catherine's apartment was followed by the Agate Pavilion, built in 1782-85. It has a semicircular Ionic gallery joining two pavilions. On the garden side, the façade is no longer Grecian, but Italian of a rusticated type resembling Giulio Romano and Sanmichele. Inside is the same mixture of the Graecian and and Italian. The hot and cold baths are on the ground floor, the Agate and Jasper rooms, and four smaller rooms on the first floor. Here Cameron had the assistance of English workmen and of the sculptors Flaxman and Rachette. 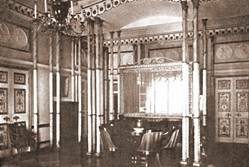 The first small room in the pavilion is bluish the round Cabinet de Toilette is pink and gold; in the great hall pink marble blends with white marble, and is adorned with gilded bronze. In the ante-chamber jasper is used with agate, and the Jasper room is divided by a portico with an entamblature supported by columns and pilasters of solid red agate. "I love to distraction these gardens in the English style - their curving lines, the gentle slopes, the ponds like lakes. My Anglomania predominates over my plutomania . . ."
But if English taste predominated in the treatment of the garden, it was found mingled with Greek and Roman forms in architectural detail. The influence of Palladio and of the other great Italian masters upon Inigo Jones and Sir William Chambers, that special phase of Classicism which may be seen in London, was transmitted to Russia by Cameron, and this is his special distinction. Cameron, as already mentioned, also built at Tsarskoe the Cathedral Church of St. Sophia (1782-1787). The silver tool which served for the foundation stone bears the inscription in English: CHARLES CAMERON, ARCHITECT, 1782. Of craftsmen working under Cameron, the following deserve mention : Charlemagne (carved woodwork), 1. Minciachi and Basseli (stone and bronze), Stubbs and Rachette (sculpture), Scotti and Bernasconi (frescoes) and Konig (glass). 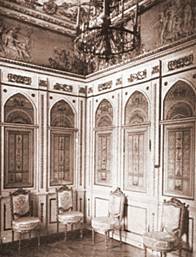 Furniture by such ebenists as Jacob, Riesener, etc., was bought, as well as bronzes by Caffieri, Gouthiére and others, yet the pieces made in the workshops at Tsarskoe compare to their advantage with those by the best of the most famous cabinet makers in Europe. Cameron worked not only for the Empress; she also found him a post with her son and heir, the Grand Duke Paul, and his Consort, the Grand Duchess Marie Feodorovna (an intimate friend of the unfortunate Marie Antoinette), who were both great admirers of his work. The palace he built for them, called Pavlovsk (1781 - 1796), is a square building, with a cupola almost copied from the Pantheon, though resting on a circular colonnade and with semicircular wing-colonnades on each side of the central structure, reminiscent of Palladian villas (Rotonda, Badoer, etc.). However, Cameron did not have a free hand here, and must have had considerable difficulties in his relations with Kucchelbecker, the "Director" of the building operations, a rather pedantic and tiresome German. The Grand Duchess also liked to give her advice, insisted on modifications while work was already in progress, and suspected Cameron to be slow and extravagant in his taste. Moreover, he was sometimes surrounded by unscrupulous and jealous contractors, as well as envious assistants, such as Brenna, an Italian architect whom he had met in Rome and invited to join him. Cameron, nevertheless, remained adamant. His Scottish pride and pertinacity did not permit of any compromise. In order to break his resistance, the Grand Duchess pretended to negotiate with Quarenghi and possibly dealt with Brenna direct without Cameron's knowledge. Cameron wanted decoration similar to that at Tsarskoe, with arabesques and vivid colours, but Marie and Paul were in favour of something "simpler and noble." As a result of this circumstance, it is sometimes difficult to trace exactly which part is Cameron's and which Brenna's (e.g., the Hall of War and the Hall of Peace). Grabar, in his History of Russian Art, attributes to Cameron only the Graecian Hall, the Italian Hall and the Cabinet de Toilette, while Kourbatov, in his Pavlovsk, attributes also the Hall of Peace. 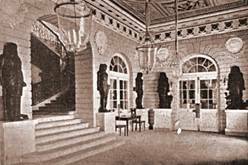 The Grand Duchess Marie has left a general description in French of the whole interior of the Pavlovsk Great Palace, particularly of the furniture, published in full in the Koudojestvenniya Sokhrovistcha Rossiya, 1903, PP. 371-382. In the centre of the Corps de Logis is the Italian Hall. It is circular, with a cupola, lighted from above, and has deep niches all round. 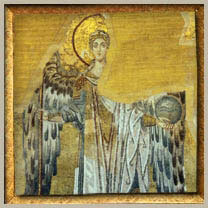 It is decorated with reliefs brought from Italy and placed on mauve and white artificial marble walls. A frieze decorated with eagles and garlands is surmounted by a gallery of which the windows and the oriels are separated by coriatides supporting the dome. Clerisseau congratulated Cameron on it. On one side of the Italian Hall is the Grecian Hall, on the other - the Staircase and the Vestibule. The Grecian Hall has Corinthian columns in verde antico, statues in the antique style placed in niches and decorative vases of porphyry and alabaster. There are, on the same ground floor, the salons, the studies and the ballroom. Cameron also completed the first floor and a few rooms on the second, before he was superseded by Brenna. A fire in 1803 damaged many rooms, including some of Cameron's, and although all was reconstructed, no doubt under the control of Brenna and the supervision of Quarenghi and Voronikhin, this was not done exactly according to Cameron's original drawings. For instance, two projects of the round hall, one by Brenna and another according to a rough sketch of Cameron's, permit, on comparing them, to draw a careful distinction in attributing parts to one or the other. 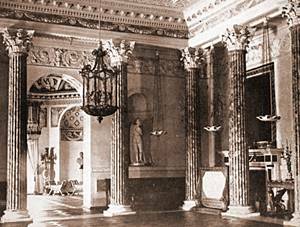 The assistants of Cameron in building the Pavlovsk Palace were: J. Martens (cabinet maker), Cavalieri and Visconti (bricklayers), Guillemet and Baldauf (workers in stucco), and the painterdecorators, Bernasceni, Levand, Pinchetti, Petersen, Sharman, Rudolf and others, while Rogatchev was his draughtsman. 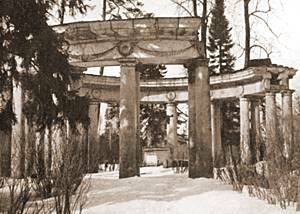 In the park of Pavlovsk, Cameron built a number of specially interesting works. The Temple of Friendship (1779-1780) was the first building in Russia of a true Doric order (as against the Tuscan Doric of Bazhenov and Starov, in 1775 and 1776). Doric, as will be remembered, became after 1800 a particularly characteristic expression of the classical revival in Russia. It figures prominently in Voronikhin's and Rossi's work - Stock Exchange, 1815-1817; Ecole de Mines, 18o6-1811, both at St. Petersburg. The Apollo Colonnade (1780-1783) was later reconstructed and transferred to another site in the park. The Voliere (1781-1784), its lower part painted in the Pompeian style, commands a view of the Slavlanka (completed by Voronikhin); the Memorial to the Parents (1786), and the Pavilion of the Three Graces (1800). The Memorial to the Parents has a Doric portico and is by sorne authorities attributed to Voronikhin. The Pavilion of the Graces is a copy of the Erechtheion. Of other structures in the park, the Farm (1781) and the Dairy (1781-1784), both no longer existing, were especially characteristic of the coming age of sensibility. There are also an Obelisk commemorating the foundation of Pavlovsk (1782), a Kitchen (1783) and a Stables building (1787), a separate Music Pavilion (completed by Brenna, 1799), the Elisabeth Pavilion (1800), the house of the Vicar (1778-1779), several small villas, a hospital, greenhouses (1785), a hermit's cell and several bridges and cascades. Fortunately, all the drawings, some of them signed and dated, have been preserved in the archives of Pavlovsk Town, and later transferred to the Palace Museum. They can be divided into three groups : 1) signed projects, (2) unsigned projects, yet which can be attributed to Cameron, and (3) projects executed by assistants and pupils in his workshops. Of buildings by Cameron, other than those connected with Tsarskoe and Pavlovsk, nothing has been known even in Russia until 1910, let alone in England. One of the painters, Gonzago, or Gonzaga, left a great number of drawings, and appears to have taken a share even in the defining of the exterior of the Palace and its galteries. teries. In the provinces, it was in the Crimea and the Ukraine, where Cameron worked between 1790 and 1800. Invited by Count Razoumovsky, (brother of Elisabeth's favourite) he went to Batourin and drew up plans for a palace which at the same time was also to serve as a university. If, as is believed, Rinaldi also had been to the Ukraine, that building was not his, as from Razoumovsky's correspondence with Count Gudovitch we know that later, when Cameron left for England, he was replaced by the Russian architect Lvov. Batourin Palace was almost completed by Cameron and is an imposing mansion with eight Ionic columns, forming a portico placed on a plinth. 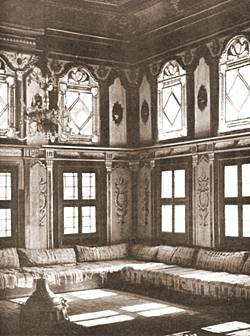 The windows of the first floor are enclosed in massive Italian Renaissance frames, and not unlike the decoration of the ground floor of the Agate Pavilion at Tsarskoe. The windows of the first floor are richly decorated with small frontons. The plan as a whole, resembles Palladian villas at Piombino, Montagnana and Malcontente,but the proportions are on a much grander scale, an is not unlike the central building of the Pavlovsk Great Palace. After the death of the Hetman, Batourin remained unfinished, was abandoned and reduced almost to ruins. It was restored only in 1911, thanks to the Society for the Preservation of Historical Monuments under the direction of the author, but in 1923 it was almost destroyed once again, by fire. It seems likely that Cameron had also other commissions in that country, as he had been staving there several times on his way to the Crimea. 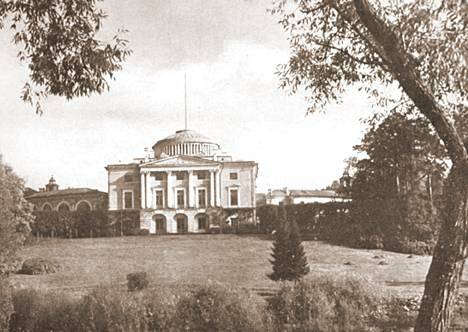 Thus, another palace, Lialitchi, built between 1800 and 1810, for Count Zavadovsky, can be attributed to him. Quarenghi, who for no reason is believed by Gornostaiev, and erroneously also by Grabar, to be the author of Batourin, is also indicated by N. Makarenko, for no more reason, as the architect of Lialitchi (Starye Gody, 1913). This estate, which is near Batourin and in the same province of Tchernigov, is also not far from Khotien, and these three mansions seem to have been built by the same, strongly Palladian architect. It is possible, however, that the interior of Lialitchi belongs to Quarenghi, who took over the work after 1800, when Cameron left for England. One day it will also perhaps be possible to attribute to Cameron the four delightful pavilions at the Belaya Tserkov (White Church), the estate of the Branicki family, in the province of Kiev, but at present there is no documentary evidence available. In the Crimea is also Bakhtchisarai, the old capital of the former local Khans. For the reception of Catherine it was necessary to reconstruct the old palace, and here Cameron succeeded in preserving on the whole the old fifteenth-century style. He is also known to have made a project for a triumphal arch in the South, so the arch at Novgorod-Seversky may in the end prove to be his, and not Clérisseau's. A great number of drawings by Cameron are still to be found in the Institute of Engineering at Leningrad, the Hermitage, the Moscow Historical Museum, and the archives of the War Office, the Foreign Office and the Vorontsov family (now at the State Archives, vols. 362, 428, 536, and 546). Some of these have been exhibited at the Historical Exhibition of Architecture in St. Petersburg, 1912, and the Architectural Exhibition in Moscow, 1913. 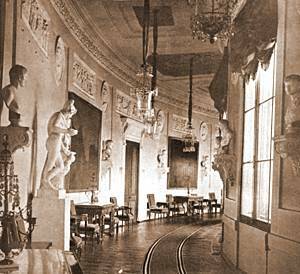 Two drawings have been discovered at the Gatchina Palace in 1918. Many drawings are rather hastily and negligently done, and are not signed, but some are magnificent and well finished, such as those of the exterior and the interior of the Gallery and the Agate Pavilion. A series of designs, in the style of the brothers Adam, represent doorways, admirably executed in colour. Others shcw details of the same rooms, or variations of medallions, etc., which just proves a serious and conscientious attitude, as was Cameron's. The drawings preserved at the Museum of Old Petersburg (in the Anitchkov Palace, on the Nevsky Perspective by the Anitchkov Bridge over the Fontanka River, a "Marlborough House" of Petersburg, where the Dowager Empress Marie Feodorovna (the second) daughter of King Christian X of Denmark and sister of Queen Alexandra of England, took up residence after the death of her husband, Alexander III, in 1894, bear merely the inscription "A.M. Im-le ("To Imperial Majesty"). There are only three drawings in the British Museum, and one in the Victoria and Albert Museum. In the Library of the Royal Institute of British Architects there are several volumes of designs by Clerisseau, and it is possible that some of them are in fact Cameron's, for the similarity between them is often so great that it is impossible to make a distinction. The drawings for the decoration of the Pavlovsk Palace, exhibited in Moscow in 1913, and particularly the album of original designs at the Institute of Engineering, St. Petersburg, date from 1764, when Cameron was still in Rome, and show the wide range of his imagination, whether in antique detail, or candelabra, or furniture design, and prove how Cameron was always anxious to bring the whole into perfect accord. This album of 115 drawings, bound in leather, bears the inscription "Drawings." All Cameron's drawings are easily distinguishable from those by other contemporary architects, such as Quarenghi. Their manner is delicate and veiled, the line is very often broken, full of fancy and brio, all is dictated by temperament, rather feminine, and displays impatient emotion bordering on ecstasy. The colours, a mixture of blue and brown, yet very warm, render them almost irreproduceable. He seems to have cared little for accuracy, for he visualised architecture in space, in nature, and not on paper. His drawings were thus not easily understood, and this may account for some of the many misunderstandings between him and the Grand Duchess Marie, and for his frequent quarrels with his assistants. However, the somewhat negligent manner of Cameron's drawings did not imply any lack of attention to technical detail, of which he always took great care. All that he built was solid, though expensive to a degree, which sometimes irritated even Catherine, his only patron who realised his true qualities and gave him commissions on a scale worthy of his genius. The work of Charles Cameron provides a missing link in the chain of the history of architecture in Russia. Uniting as it did the Eighteenth Century Baroque with the Empire style of the beginning of the Nineteenth Century, and although English in taste, it was based on the principles of Roman Classical Art and introduced certain sobriety and simplicity of design in the evolution of Russian decorative art. It has, as it were, cured it of the Baroque tendency under Cameron's healthy lead, and given it an entirely new direction. In the strictly architectural realm Cameron's influence has perhaps been less felt. He did not found a new school, though he certainly was responsible for much creative work. It is in the decorative art - furniture, bronzes and everything connected with interior decoration - that his taste has almost formulated a style of his own, while his influence on the art of landscape gardening has been greater still. 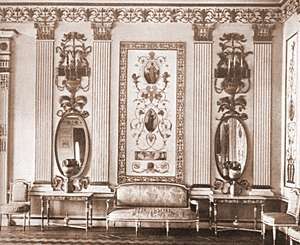 His favourite motif was invariably the medallion, with a bas-relief of marble, stucco, or Wedgwood. The other devices, then used in Russia for the first time, included friezes with mythological designs, pilasters, mural paintings, niches with vases and statuettes, mantelpieces with bas-reliefs and often Wedgwood plaques, and the use of marbles of different colours, of bronzes, and porcelain. All of this may rightly be attributed to Cameron as his own invention. Doors, ceilings, cornices and parquet flooring, even minutest objects, such as locks, keys, doorknobs and fire dogs, are executed with the same great care and are full of variety and richness. No two rooms are alike either in plan or decorative treatment. Lastly, the use of such materials as agate, jasper, malachite, lapis-lazuli, has created splendid and harmonious ensemble. In the private apartments of Catherine the mantelpieces were restrained and elegant, and they were repeated in several of the rooms. The lower half of these mantelpieces is of white marble carved with ornamentation of garlands and delicately modelled profiles. The upper portions are of gilded woodwork, also richly carved. The frame of the fireplace is composed of two upright pilasters, in which are inset figures of goddesses and cupids, of lions or other ornaments, surmounted by a cornice similarly enriched with garlands, ribbons and crowns. 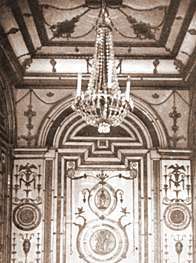 The upper part, containing the glass mirror, framed in wood, is always richly ornamented and gilded. These are sometimes in the form of pilasters, fluted columns, or rosettes. This type of chimney-piece, or chimney-console, is in several rooms. The other type, the chimney-piece without a mirror above, in white marble, is less elaborate, almost severe. Such may be found in the rooms on the ground floor of the Agate Pavilion and in the Bathrooms. Finally, as an exception, there is the chimney-piece in the great Hall of the Agate Pavilion, and two others in which statues, carried from the pilasters, serve as caryatides. These statues, carved by Rachette after Cameron's designs, are remarkable for the delicacy of their execution and classical grace. Among the drawings attributed to Clérisseau, in the Library of the Royal Institute of British Architects, are several designs for chimney-pieces. In spite of their resemblance to those at Tsarskoe unquestionably by Cameron, these are attributed to the French Master, though one would be justified in assuming that they are Cameron's. The parts in stone, whether jasper, agate, marble, alabaster, or porphyry, were made either in the Imperial Factories at Peterhof, until recently still in existence, or at the Kolyvan factories in the Ural. In the halls at Pavlovsk the works in sculptured stone were carried out in Cameron's workshops at Tsarskoe, and here again we see some remarkable chimney-pieces. In particular, there is one, perhaps the finest of all, composed of a pedestal surmounted by pilasters of red agate. In the frieze is a bas-relief of white marble on an agate background, representing nine muses. It is of a rare delicacy of execution, and on either side there are medallions enclosing goddesses. Above, in place of a mirror, is a large bas-relief with a composition of figures and a frieze of acanthus ornament with a panel of confronting griffins, carried out in agate and bronze. The whole design is in harmony, worthy of a great master, and the technique of treatment perfect.